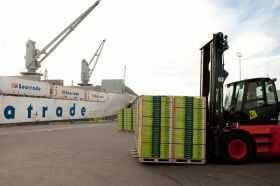 The Port of Tauranga is set to expand its kiwifruit handling operations, under a 10-year freight agreement with single-desk marketer Zespri International and Tauranga Kiwifruit Logistics (TKL), a freight company controlled by a number of the New Zealand industry’s leading post-harvest operators. Port chief executive Mark Cairns told the Bay of Plenty Times the deal was brokered late last year, however, all parties agreed to publically disclose the news in the shipping hub’s recently released six-month results. In accordance with the agreement, the port revealed the volume of kiwifruit exported through its docks had risen to 413,102 tonnes over the six months to 31 December 2015, a 22.9 per cent increase on the corresponding period of the previous season. The agreement will see upgrades made to cool storage and port operations to cope with further increases in kiwifruit export volumes over the next decade. "Our style of doing business is to negotiate long-term partnerships with the shippers that mean we can take a proper planning perspective on when we put the infrastructure in," Cairns told the Bay of Plenty Times. "With the kiwifruit, it's about where we put the cool storage - we have to make multimillion investments and, in this case, it is over a 10-year agreement." Ian Mearns, chief executive of TKL, said the respective parties were still in the first round of discussions about what the expansion would cover, although he said the aim was to update cold storage infrastructure this year. “It's all about making sure we are engaging with the port and letting them know what is happening from the kiwifruit industry side and giving them the opportunity to prepare and be ready for those increased volumes,” Mearns told the Bay of Plenty Times.